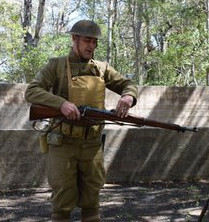 Spotlight | Friends of Fort Caswell Rifle Range, Inc.
Carl Mauney, a World War I reenactor, made a welcome appearance April 8, 2017, when the Brunswick Town Chapter NSDAR along with the Friends of Fort Caswell Rifle Range held the Commemoration of the Centennial date the United States entered World War I: April 6, 1917. The event was the first commemoration held at the site of the 1918 World War I Rifle Range located in Caswell Beach. Read several stories linked from here. Carl was outfitted with a full World War I reproduction woolen uniform, including gas mask and rifle. He demonstrated how the rifle worked and explained that rifle ranges like the Fort Caswell rifle range placed the line of fire 300 yards away because the rifles could not consistently hit targets at longer distances. Carl modeled his gas mask, showing how difficult it is to breathe or even hear. This is similar to the experiences of veterans described in a recent WWI Profile post. Carl also made a guest appearance at the 2017 Derby Day fundraiser, an annual event to raise funds for continued stabilization of the rifle range. After each race he read an excerpt about a WW I soldier from the WWI Wall of Honor. Carl Mauney became a permanent fixture at the Friends of Ft Caswell Rifle Range when his profile was used for the WWI Centennial logo. We thank Carl Mauney for contributing his time, knowledge, enthusiasm for WWI, and his silhouette! Local artist Helen Radcliffe, shown here in her Kentucky Derby apparel, dedicated many hours planning and finding the best views of the rifle range, and finally selected the photograph to produce this beautiful watercolor painting of the rifle pit. The original painting is displayed on the wall in the Caswell Dunes Clubhouse. The image was used to create mouse pads, magnets, note cards, and prints which have been sold to raise funds for the stabilization project. Helen received no compensation for her efforts. In addition, Helen has spent many hours pursuing donations from local businesses for items and services to offer in the silent auction at the Kentucky Derby Day fundraiser. She also manages the silent auction event. For two years, she offered a silent auction item – to the winning bidder, an original painting of their home. A former art teacher at The Children’s Home in Winston-Salem and Curator of Education at Reynolda House Museum of American Art, Helen now shares her talent with the community. Her artwork featuring the Oak Island Lighthouse is currently displayed in Caswell Beach Town Hall. Thank you, Helen, for the gift of this everlasting image to our community! Local artist and Caswell Beach Commissioner Marti Hardy created and donated a total of four striking stained glass and mosaic art pieces for past Kentucky Derby fundraisers. The first two are pictured below. Marti is holding Beach Parade, a table display of swimming fish mounted on driftwood that Marti discovered on Caswell Beach, while Joan Van Noordt is holding Bunker Serenity, an abstract piece depicting the rifle range and surrounding landscape. The remaining two, created and donated the following year, include At Peace with Nature, a stained glass design showing part of the rifle range wall surrounded by trees with a squirrel resting on the wall, and a red-headed woodpecker on the side of a tree. The scene is drastically different from what the area might have looked like almost 100 years ago, surrounded by the military engaged in marksmanship, noise everywhere. Marti chose a serene setting for her work, keeping the focus on history, showing the peacefulness of the area by including animals in their habitat. Her focus for the mosaic is The Yellow Belly Fish of Caswell Beach. It has a yellow belly and is surrounded by seaweed as it floats through the water. The fish has an orange tail with neutral colored fins and gills. The Friends of Fort Caswell Rifle Range earned $600 through Marti’s stained glass pieces. Thank you, Marti, for these gorgeous treasures! Attorney Mark Bachara completed pro bono legal work enabling the Friends of Fort Caswell Rifle Range to move forward with non-profit status. This is just one of many community-centered causes Mark supports through his involvement with the very active Southport Rotary to serving on non-profit boards. He has even been spotted belting out showtunes at various local venues. Thank you, Mark, for donating your legal expertise to our cause! Brunswick Town/Fort Anderson Site Manager Jim McKee (formerly the Historical Interpreter at that site) began working with the Caswell Dunes volunteer Landscape/Grounds Committee in 2011 when we needed advice on what this structure actually was and what to do with it. After the first visit, Jim brought the NC State Historic Preservation Office staff and others to the site to identify the WW I structure. Jim continued to donate hours of work on his day off from his position at Brunswick Town/Fort Anderson to assist us clearing years of soil from the bottom of the pit. Recently he supported engineers Paul Shivers and Brian Ross by being on site when they were identifying trees that compromised the passageway wall. Jim continues to stay in touch with the Friends by suggesting ways the World War I Centennial may be approached. Thank you, Jim, for six years of guidance! Check out Brunswick Town/Fort Anderson’s Facebook page. Paul R. Shivers, PE, a Project Manager with Highfill Infrastructure Engineering, PC, has donated many pro bono hours working as our project manager for the stabilization efforts of the Fort Caswell Rifle Range. He coordinated with the various engineers that conducted tests to help identify priorities for the stabilization. The Friends are highly appreciative of him sharing his knowledge and time. Paul donates his time to other projects within the community such as serving as President of the Friends of Brunswick Town/Fort Anderson, which is the non-profit support group for the state historic site. Thank you, Paul, for your contribution to our efforts! Read http://www.hiepc.com/paul-shivers for more about Paul.